Modular homes are definitely on point when it comes to contemporary design and architecture trends. We see these geometric beauties popping up everywhere, and it is sure to be the prevailing style for years to come. The sleek modernism and pure minimalism of such projects will win us over every time. Here is our first look at the residence in question. It may look simple at first glance, but once you take a moment to appreciate its features, you certainly become aware of some interesting and noteworthy details. The simple white, modular structure lays the groundwork for a minimalist design, which is always welcome in modern architecture. In this image, we can see the parking bay of the house, adjoined to the side of the building. At the back of this section, we can see a wooden grid, the same which covers the window facing the street at the front of the house, creating a sense of continuity. The grid at the back of the parking bay is covered in creeper plants, which gives the whole ensemble a beautiful, natural touch. Now, let's get inside the house to see what things look like on the interior. From the very start, we can see that this house consists of high-quality materials which are all very suited to an elegant modern style. The polished concrete floor gives both an air of sophistication and a touch of industrial style. This eclectic combination is a contemporary treasure. To the right, we can see the glass which separates the interior from the courtyard, which we will explore in details a little later. 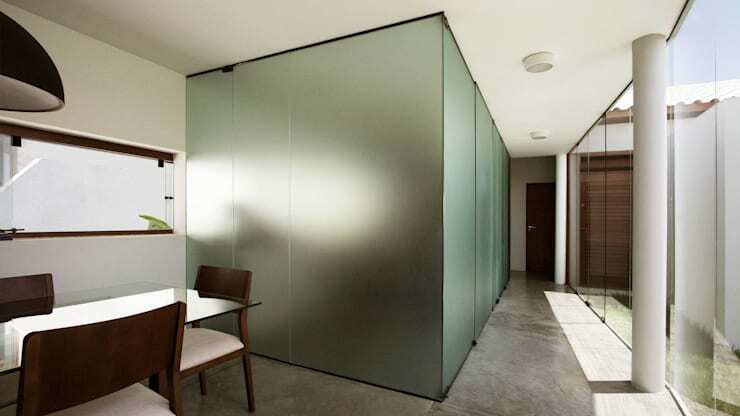 To the left is a sandblasted cube, which neatly and subtly disguises the bedroom from the openness of the social areas. Now for the real treat—the gem we have been alluding to since the beginning. In the back of this picture, we can see the courtyard of the property. This enclosed space is still quite generous and allows for some private outdoor space in the absence of an extended property and backyard. 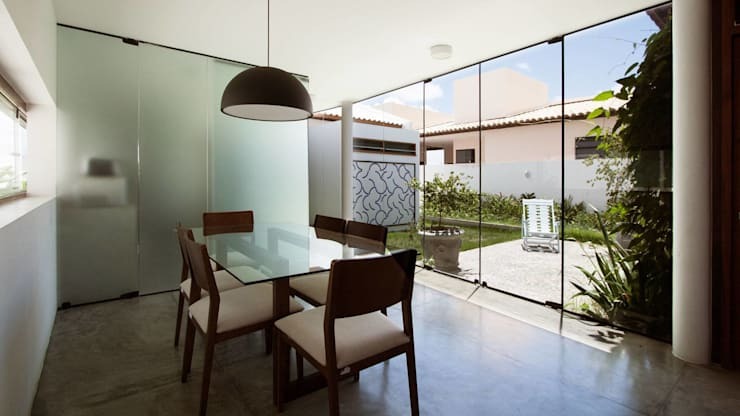 As we can see here, the only division between this wing of the house and the courtyard itself is made entirely of glass, allowing for unobstructed views of the outdoor space. What's more, this also lets in plenty of natural light to fill the entire interior space. In the courtyard, we can see a bit of a patio where the inhabitants can lounge on garden furniture at their leisure, while there is also a patch of grass next to a flower bed to enjoy the treats of nature. At the back of the courtyard, we can see a mosaic art installation to enhance the aesthetics of the scene. To step up your own game when it comes to courtyards, take a look at these: Simple ways to improve a small courtyard. Nearest to us in the image, we also find a dining room area, which includes a stylish table with glass table top, as well as modern and minimal chairs to accompany it. These are a subtle combination of wood and leather, making for a stylish addition to the elegant space. Our last stop of this wonderful modular home brings us to the kitchen. 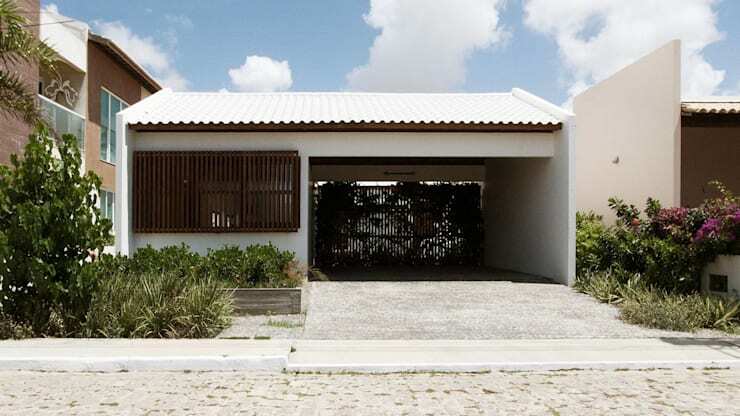 Here we take a few minutes to appreciate both the subtleties in the design and construction of the home, as well as the gestalt value of it all—the fact that the whole is larger than the sum of its parts. Firstly, just take a look at this granite counter top and working space here in the kitchen area. This rich material lends to the room an air of sophistication as old as architecture itself. This is complemented by a lack of superfluous ornamentation and a beautiful simplicity of objects. Behind the sink area of the kitchen, we can see a large window also looking out onto the courtyard. 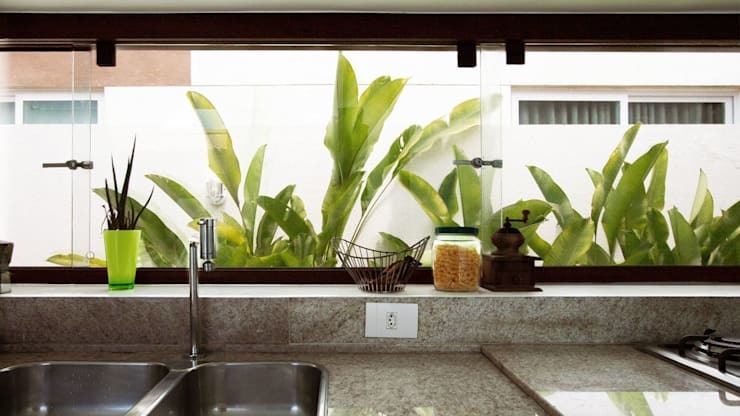 Here we can clearly see the influence of nature and the common theme of the courtyard brought into the kitchen as well. This house definitely makes for a beautiful ensemble! What did you think of this home's courtyard? Something you'd like to try?